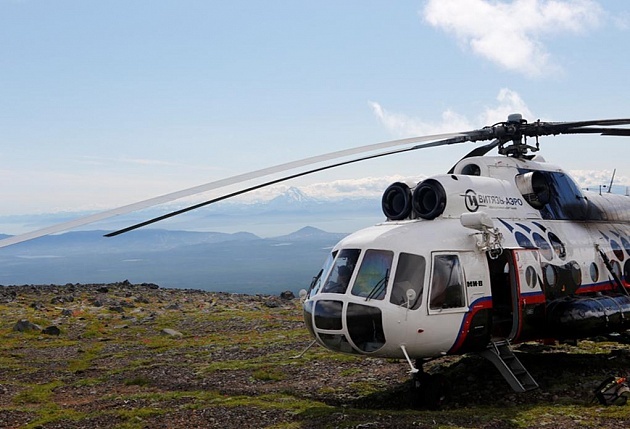 A new helicopter tourist route – an excursion to the volcano Ksudach and Khodutkinskie hot springs – opens on Kamchatka. – One of the leaders in the field of helicopter transport in the Far East, the company Vityaz Aero, launches a new product for Kamchatka – year-round helicopter tours to the reserved places of the region. They will make it possible to make accessible the unique remote natural sites of the peninsula, which were previously accessible to a few tourists. The first test route, which will open in the near future – a flight to the volcano Ksudach and Khodutku. Two main advantages are the price, which will be significantly lower than other popular tourist helicopter excursions, and filling the program is a journey to the monuments of nature, amazing places that many dream to see, – said the head of the Agency for Tourism and External Relations of Kamchatka Elena Stratonova. The excursion program to the volcano Ksudach and Khodutkinsky springs will include a fleet of active volcanoes Mutnovsky and Gorely. – First of all, we want to make excursions more accessible for the inhabitants of Kamchatka. Within the new route, tourists will be able to see the picturesque crater of the active volcano Mutnovsky and the acid lakes of Gorely volcano from a bird’s eye view. We planned an interesting excursion to the caldera of the volcano Ksudach, which is declared a natural monument. A powerful eruption at the beginning of the last century destroyed the cone of the volcano, two lakes formed in the caldera. These are amazingly beautiful places, where the effects of the eruption are still visible – in the crater there is a “hot beach”. The final part of the route – landing in an equally picturesque place – at the foot of the volcano Khodutka, which provides bathing in a hot river. The water temperature there reaches 40 degrees, and the water of the silicon source is considered curative, “said Victor Sirotin, General Director of Vityaz Aero. It is expected that the cost of a day excursion to Ksudach and Khodutku for residents of Kamchatka will be 22 thousand rubles. It is almost twice cheaper than other popular tourist helicopter excursions in the region. The new product is designed to develop ecological tourism in the province, making helicopter tours more accessible. In addition, the natural objects included in the route are equally interesting for visits in the winter, and not just in the summer. Subsequently, the company plans to expand the excursion program. One of the possible directions is Nalychevskaya valley. In the near future, the company “Vityaz Aero” and “Vityaz Travel” are planning to hold a promo-tour for their partners – tour operators. The company has already started selling vouchers, the cost of travel is now 20 thousand rubles. Recall that now most of the tourist helicopter excursion programs are valid in the summer. Among the most popular are flights to the Valley of Geysers and the Kuril Lake.